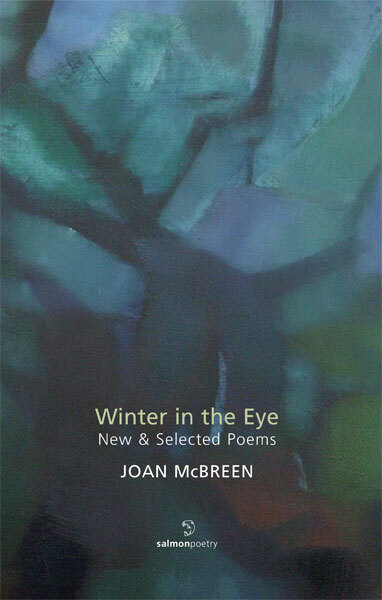 Winter in the Eye: New & Selected Poems brings together Joan McBreen's recent work with poems selected from her two previous collections. This volume captures her elegant and finely-tuned lyric voice. A subtle simplicity of language makes her poems of place and home all the more powerful; highlighting moments of universal awareness and reaching beyond the poet's life into our own. McBreen's recent poems about illness and loss are written with a spare, unflinching beauty. Her moving, elegiac tone is ultimately a celebration, as darkness gives way to light. This is a poetry that seeks and reaches toward harmony, and truth. as if illness had swerved towards us. believing we can accept harsher weather. I am looking down dense corridors of trees. solidifies worktops, appliances, stacked papers. I move into this vacancy. wet leaves clog gutters and drains. its wings against the window-pane. Poets, explicitly or obliquely, often refer to the physical topography of the "real world" to map the spiritual geography of their inner landscapes. Literary criticism has coined graceless terms such as "objective correlative" and "subjective correlative" to outline such a writing strategy. Poetry's "credibility", as Seamus Heaney put it, lies in "its truth to life, in every sense of that phrase". This simple yet complex remark is appropriate to introduce the latest collections by Irish women poet Joan McBreen. Joan McBreen's third collection, Winter in the Eye: New & Selected Poems, collates her recent poetry and a selection from her previous two books, The Wind Beyond the Wall (1990) and A Walled Garden in Moylough (1995). Her poetry, too, revolves around the meanings of and relationships between outer and inner landscapes. The closing lines of 'Poem in Autumn' (words that "burn through the blood,/ cold as gulls inland from the sea") and of 'The Other Side of the River' ("The river moves on its course,/ leaving me to forget myself or learn my place") are characteristic of this geographical and existential short-circuit. Atmospheric changes, even when unexpected, are therefore the "logical" channels (sometimes too predictably so) of emotional changes. These connections, however, remain consistently crucial. They allow the poet to achieve a distinctive, comforting harmony between what happens and where and why it takes place. The reader can immediately detect and partake of what could be termed the poet's cathartic acceptance of the "facts of life" - illness and los, as well as familiar places and home, are dominant themes in her new poems. McBreen addresses them with honesty and voices them with an elegiac gentleness that gives her readers a sense of almost therapeutic tranquillity. This is, perhaps, the reason why her personal stories are ultimately perceived and understood as universal ones. Poems such as 'The Terminology of Love', 'London in December' and 'Poppies in Dominick Street' (with its final lie reminiscent of Montale: "and a field of poppies/ mad with light") are fine examples. In 'Crediting Poetry', his 1995 Nobel Lecture, Heaney gives credit to poetry because it "can make an order as true to the impact of external reality and as sensitive to the inner laws of the poet's being". Distinct voices in contemporary Irish poetry, Rosita Boland and Joan McBreen have precisely this in common: their poetry testifies to the inner laws of their beings. Marco Sonzogni is a critic, editor and literary translator. © The Irish Times, 2003. As with every profession, there are writers whose 'commitment' is marked by rung-hopping up the ladder of what they define as success, usually by courting the right people, especially the right columnists, and flattering in tones worthy of Stendhal's Parma courtiers; and there are those who work steadily and consistently in the shadows, as it were, whose voices are heard only in the work itself and without whose diligence there would arguably be no decent writing at all. Joan McBreen is one of these. In her ground-breaking anthology - before Field Day had come round to addressing the issue - The White Page / An Bhileog Bhan McBreen thrust Irish women poets of our century into the world and, not surprisingly, the anthology has been reprinted. As much as being a work of considerable study, compiling this anthology was a distinctly unselfish act in an age when many poets are selfish and self-interested (it may be noted in this context that royalties from sales of McBreen's new book are to go to the Leukaemia Trust at Galway's University College Hospital). If she didn't produce another line of her own, McBreen's anthology would remain a worthy achievement and a marker on the map of Irish women's writing. So it was time, perhaps, that a 'selected' came out. I've always been chary of Collecteds and Selecteds, especially when publisher-poets produce their own, and when I was asked to compile one of my own I felt that I had, in some sense, passed over into some other, more antique realm; that it was my fiftieth birthday party all over again. I also felt distinctly undeserving. Be that as it may, selecting what one may deem to be the best of ones work, if one has published some volumes before, it is not utterly a bad thing; there is an opportunity for reassessment and one finds almost always that the poems one thought were ones best in the past are the first to be chucked out. Whether this spring-cleaning process is of interest to our tiny poetry public is another matter. And do we contemporary poets have a subconscious wish to mature prematurely? For there is a rush, I sometimes think, to bring out the Collected or the Selected before it is due. Whether this is down to publisher or poet, I do not know. McBreen has produced two collections of poems; I leave the question open. Now this poem carries an epigraph from Carolyn Forche, an American Nobel poet forcefully politically engaged, whose own anthology, Against Forgetting; Twentieth Century Poetry of Witness, contains work of almost 150 poets writing about the erosion of civil liberties and abuses of human rights. Perhaps not surprising that McBreen, whose own anthology make waves in a different sense, should be drawn to this writer who believes that poets should do the work journalists won't do (it has been rather the other way round over here). whose disconsolate leaves blow around us. What makes this poem significant is the snapshot image as much as the allegory, almost mediaeval, of planting, resurrection, the virtually religious rite of the willow cuttings, described in the first stanza, lined upon a table, wrapped, gift for friends, signifiers of the underworld. 'Solstice 2001' is a memorial poem to the poet and singer James Simmons, who died after a long illness in 2001. Simmons, in my view, was particularly significant, not just for his contribution to Ulster poetry, but for his bridging the gap between song and poetry, a gap widened in the drawing-room and very Edwardian English mentalities of too many Irish poets. The Honest Ulsterman, his magazine so prominently, was supposed to produce an issue with memorial poems to Simmons, but a long time has passed and nothing has happened so far. There's a simplicity, the line-drawing basicness of a Japanese ink here; the poem might have become a tanka or haiku. Memory and tragedy seem entwined in the new poems; but this is not a particularly mournful collection. If in any recollection there is wistfulness, then all poems mourn. I have not always been a fan of linguistic simplicity in poetry, or thematic simplicity, for that matter, as it can often deteriorate into mushy prose, like decent peas too long boiled. McBreen's new poems have avoided this, however, by being informed by a new deliberateness, a having-to-be-written-ness about the poems which often makes the difference between a good apparently simple poem and a bad simplistic one. 'Memory' is a very good and deceptively simple poem to Medbh McGuckian; time passes, the poets grow older, the earth does too; interesting to what extent McBreen utilises images of houses, walls and gardens to inhabit her poems with a sort of domestic reference-point; a painter, perhaps, painting the same house but from different angles. We might ask a similar question of everyone who has ever impressed us; whose everydayness we could only with difficulty attune to the magic or wisdom they imparted or gave to us. For this is a poem about how one poet inspires another, how life inspires life; and growing out of the dark loam of these poems is the resurrection of new things, hopes, new grass for new-born dreams to stride upon.